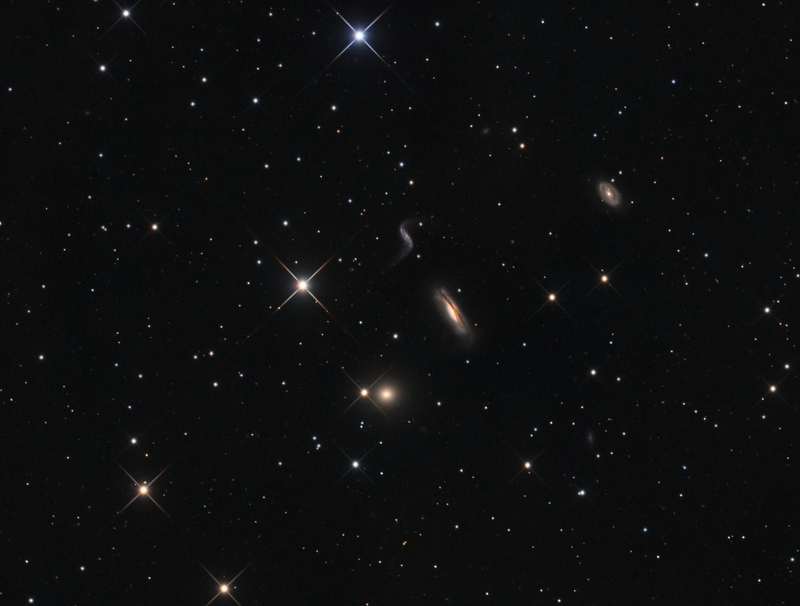 This group of galaxies is known as Hickson 44 (the 44th entry in Hickson’s catalogue of compact galaxy groups). It lies in the constellation Leo, sitting on the lion’s shoulder. It is at a distance of about 80-100 million light years. The largest galaxy, near centre, is NGC3190. 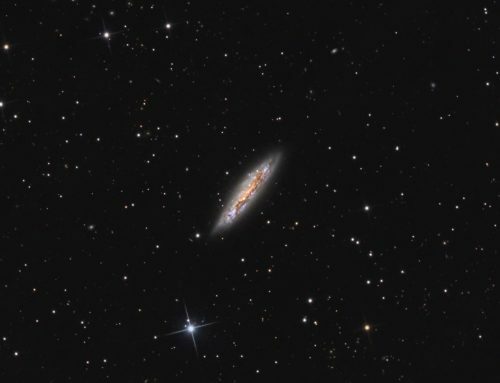 The S-shaped galaxy is NGC3187. 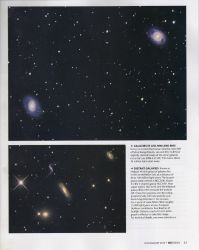 Near upper right is NGC3185, and elliptical galaxy NGC3193 lies towards the bottom of the galaxy group in this image. 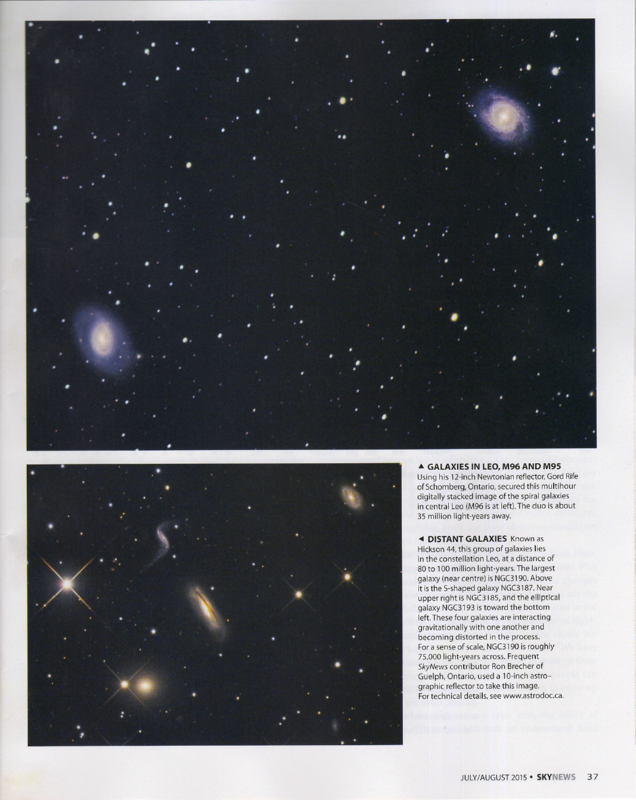 These four galaxies are interacting gravitationally with each other, and becoming distorted in the process. 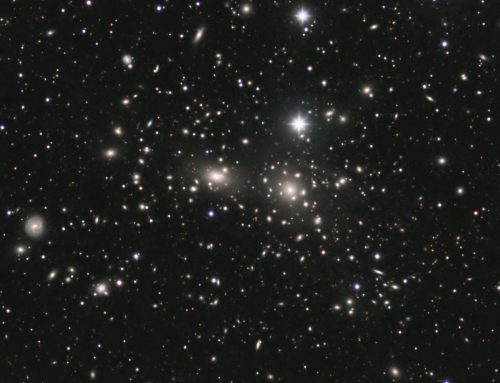 Several other galaxies appear as faint smudges. 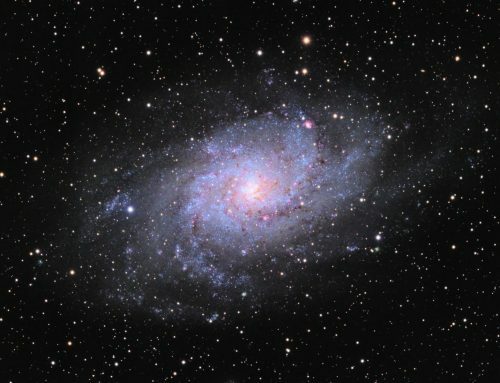 To give a sense of scale, NGC3190 is about 75,000 light years across. SBIG STL-11000M camera, Baader LRGB filters, 10″ f/6.8 ASA astrograph, Paramount MX. Guided with STL-11000’s external guider and 80 mm f/6 Stellar-Vue refractor. Acquistion, guiding and calibration done using Maxim-DL. Focusing with FocusMax. Automation with CCDCommander. Registration, integration and all processing in PixInsight. Shot from my SkyShed in Guelph, Ontario. No moon; good transparency and seeing. 6x10m R, 6x10m G, 6x10m B and 29x10m L unbinned frames (total=7hr50m). Creation and cleanup: L, R, G and B masters were cropped. R, G and B were combined to make an RGB image which was processed with DBE and ColourCalibration. Deconvolution: A star mask was made to use as a local deringing support. A copy of the image was stretched to use as a range mask. Deconvolution was applied (100 iterations, regularized Richardson-Lucy, external PSF made using DynamicPSF tool with about 20 stars). 4. LRGBCombine was then used to add L to make a LRGB image. Small-scalestructures were isolated by making a copy of the LRGB image and applying HDRLinearTransform with 4-layersand residual unchecked. Large-scale structures were isolated by subtracting the small-scale image from the LRGB (no rescaling). Colour saturation, contrast and galaxy brightness were boosted on the large-scale image. Colour saturation was boosted on the small scale image. Then small-scale and large-scale images were added back together in PixelMath. Final Steps: /Green artifacts around some bright stars were removed with SCNR applied using a star mask. 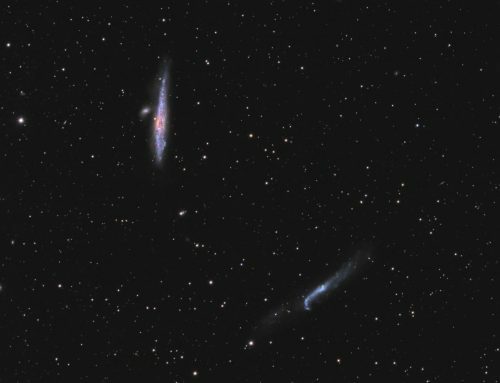 A contrast adjustment was applied to brighten the galaxies and slightly darken the background. UnsharpMask was applied to sharpen details in the galaxies. The colour saturation of the galaxies was increased slightly.